Many children, autistic or not, have those moments of screaming, crying outbursts. Tantrums are not fun for any parent, especially when one of these melt downs happen in a social setting or public place. What makes an autistic tantrum that much worse is the child’s inability to verbalize what is wrong and what can be done to fix the problem. For many autism parents, like me, through the years we pick up on things or scenarios that may provoke one of these nasty tantrums to arise, so we try our best to prepare ourselves and children. Even more preferably avoid them all together. However, there are times that we cannot avoid them from happening and must endure the wrath. My daughter, Avah, is famous for the high-pitched blood-curdling screams. It literally makes your heart stop for a second. She like others on the spectrum also has tantrums that may involve throwing themselves on the floor and then stiffening their body making it virtually impossible to pick them up. Some outburst may also include kicking, screaming, biting and self-injury like behavior. No matter how many times we see the ugliness of tantrums what makes it even worse is having all eyes on you wherever you are. Feeling like an animal at the zoo with onlookers staring, as a parent you can’t help but wonder what the people are saying to themselves. It makes me want to throw my own tantrum and yell, “She’s autistic” and storm off. Now I know the saying, “you shouldn’t care what others think” but let’s be honest. As people, in our society, we do! Parents do not want to be judged on something that is not within our control. We do not want to be seen as a bad parent or our children considered brats. 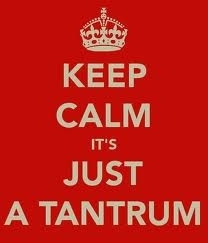 For me, and I think autism parents would agree, our children’s tantrums are misunderstood. What I mean by that is autism isn’t easily spotted. Unless you really know the child or know what some of the autistic behaviors are there is no way of telling them apart from a neuro-typical child. So to the unknown eye staring at us and our kids rolling around on the ground, they seem to be your average, misbehaving children who need discipline. Maybe sometimes that is true because they are still children however, most of the time children with autism are screaming and lashing out because of sensory issues. It could be too loud, too bright/dark, or too crowded. They may not like the song, movie, or TV channel choice. The different smells in the food court at a mall or someone around them wearing too much perfume or colgone bothers them. Something that seems small and trivial to us, is huge and overly-stimulating to them. Any of these sensory issues or change in daily routine could ignite a tantrum at any moment. So the next time you see a child having a melt-down remember this post. I ask before you cast judgment that you try to remember there may be more than meets the eye. The child may not be screaming and causing a scene to be defiant they may be autistic trying to communicate the only way they know how.